Post your comment here or on Facebook. Some happy customers and a selection of what people are saying about their experiences with Jon and THE FRET SHOP. For those of you who have not had the pleasure of meeting Jon Rose, and if you are a guitar player, get ready to meet a new best friend! As a player who always seems to be jamming with only the best, as a luthier who builds and repairs with great care & touch, as a collector who always brings out some old Gibson archtop or other great-sounding guitar, and as a student/teacher who always seems to know what arpeggio to use when soloing over a tricky chord sequence, Jon is the man! I look forward to a shop like this opening in Winchester, and plan to check it out as soon as possible. Thank You once again for the excellent job of repairing my fretless bass. The sound quality is just something I have never heard from this bass before. When I hooked into the soundboard @ church I could not believe the sound coming from this bass , very even toned , full and rich like I have never heard before . Mr Rose...... The axe arrived today around 3:00. It is a fine beautiful piece of work. I believe it sounds as good as some vintage guitars. Has a good rhythm bite to it....I think I will let our rhythm guitarist use the Eastman. On the minus side, the frets are a little larger than what I am used to but I can adjust to that quickly. Could not be more pleased and saved a few grand. 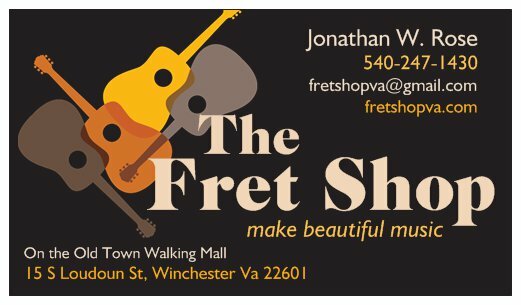 It was a pleasure doing business with you and will pass the Fret Shop name around. Many thanks -- Raymond T.